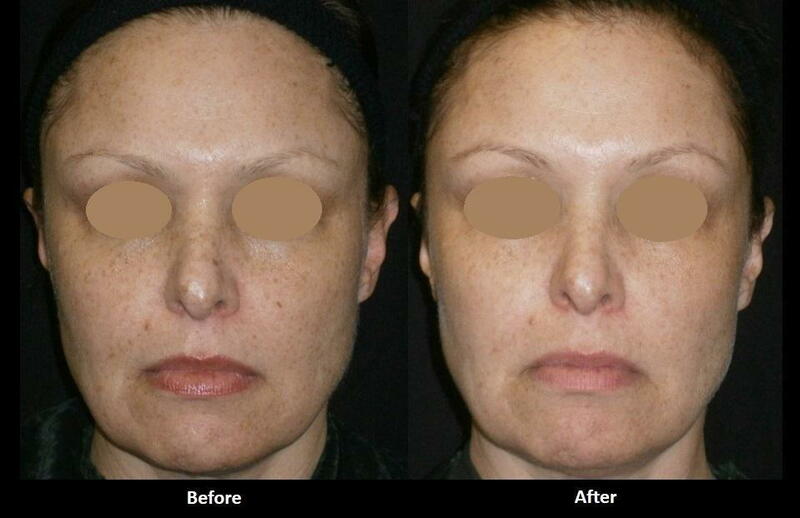 The A E Skin IPL photofacial experience is fast, safe, and comfortable, with minimal downtime, and outstanding results. We start by washing your face and taking baseline photographs to monitor your progress. Then we apply some numbing cream to keep you comfortable and let that sit for approximately 15 minutes. After that we'll clean off your face with water, then alcohol, and apply some eye protection over your eyes. You will see the bright light. Just keep your eyes closed; you'll be fine. We'll apply cold gel and cold air on your skin to keep you comfortable, and when we do the treatment it feels like a hot rubber band snapping. It takes about five minutes. People tolerate it just fine. After we're done, we'll take off your eye protection, clean off your face, and allow you to cool off with the cold air for about five minutes. We'll give you sunscreen and you re good to go. Repeat treatments are typically done at four to eight week intervals with an initial series of three to five treatments. After that, maintenance treatments are done once every three to six months. Contact Dr. Alex (818-835-1833 [email protected]) for a free consultation.